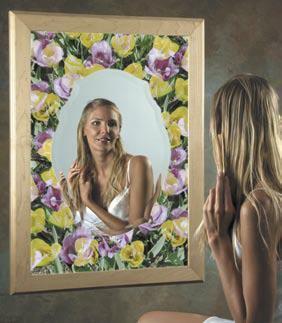 Our mirrored back-lit product can be used in a bathroom vanity, hallway or any home or office environment. Framing can be any style or color you choose and installation is as simple as hanging it up and plugging into any standard outlet. A motion sensor makes the product an automatic nite-lite that emits a soft light instead of turning on bright lights late at night. Great for children’s rooms as it only turns on with movement, saving electricity. This smaller format back-lit mirror can also be used as a nite-lite! The motion sensor makes it wonderful for bathrooms, dark hallways and stairways.